Sauspatot may have an unusual name, but is really just a flavorful stew made with sausage and potatoes. Increase or decrease the amount of peppers, depending on how spicy you like your dish. This stew can easily be served as dinner or lunch. If you’re feeling really adventurous, serve it as breakfast with a fried egg on top. Remove the stems, seeds, and veins from the peppers and dice. Dice the onion. Peel the potatoes and chop into bite size pieces. 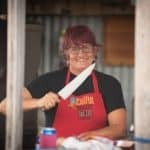 Cut the sausage into bite size pieces. Heat a small amount of oil in a sauté pan over medium heat. Add the peppers and onions and cook until translucent. Mix into the garlic, salt, and pepper and cook until fragrant. Pour in the broth, tomato sauce, water, and potatoes. Simmer on low for 1 hour. Add the sausage and continue to cook for 1 more hour, until the potatoes are tender and start to break down. Serve. Beef and Bean Stew is the perfect way to showcase beans, which simmer alongside long-cooking meats like brisket. 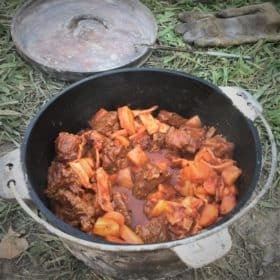 Perfect Dutch oven dinner for those cold camping evenings Beef and Vegetable Stew is both easy to cook and enjoyable to eat. Serve with fresh baked breads. Beef Stew cooked over the campfire is a warming and cozy way to end the evening. 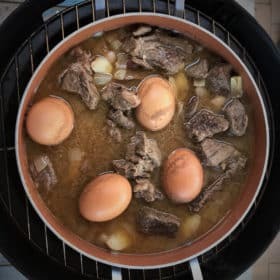 Start this stew before you set up camp, so it has a chance to simmer and be ready in time for dinner.